The announcement of Justin Trudeau’s new cabinet, the first in Canada to include equal numbers of male and female minister, triggered a backlash among commentators who claim to prefer cabinet appointments to be made ‘on merit’. A wonderful spoof article observed that ‘50% female cabinet appointments lead to 5000% increase in guys who suddenly care about merit in cabinet’. What is ‘merit’, anyway? And how is it applied to the process of cabinet appointments? Advocates of merit in cabinet appointments appear to be referring to a ‘merit system’. They want ministers to be appointed because of ‘competence’ not ‘political affiliation’. And let’s be clear: it is not just the guys who call for appointments to be made on merit. In 2013 Anna Burke, former Speaker of the Australian House of Representatives, criticized faction leaders in the Australian Labor Party as ‘faceless men’ who were ‘firmly in control’ of the ministerial selection process, to the detriment of women who hoped for a ‘meritorious selection’. Rainbow Murray of Queen Mary, University of London is doing excellent work unpacking the dubious notion that all incumbent men secured positions of political power ‘on merit’. There is no standard definition of what merit is when it comes to ministerial recruitment. Much evidence points to the notion that merit in cabinet appointments equates to ‘being entitled to reward or gratitude’. However, a seat in cabinet can be granted in reward for a range of characteristics deemed meritorious to a new Prime Minister or President. The selector of cabinets is most usually the PM or president, though sometimes parties get involved. Her job is to put together a collective, the cabinet. Individual ministers are appointed to that team not just because of individual qualifications but also because they add something to that collective endeavour. What constitutes merit, therefore, also varies individual by individual. Policy expertise. Your merit is that you have specific policy expertise or a professional qualification (e.g. a Law degree) deemed necessary to master a ministerial portfolio. This type of merit is said to be more relevant in presidential democracies and ‘specialist’ parliamentary democracies such as the Netherlands. Political experience in a party or in parliament. Here your merit is that you have demonstrated ‘generalist’ political skill over time in your party or in parliament. This type of merit is most significant in Westminster parliamentary systems such as the UK, Canada, and Australia but is also important in states such as Germany. Loyalty to the PM, president or party. Here your merit derives from the fact that you have demonstrated a high degree of loyalty, reliability and trust to the person who makes decisions on ministerial selection. This version of merit is arguably the most significant, and applies everywhere. Representative criteria. Here your merit is that you represent a certain demographic, region, religion, minority ethnic group or party faction that the selector, for representational balance, deems necessary to include in her cabinet. These representative norms are often guided by broader national conventions and would apply to all selectors: in Germany the largest Länder must be represented, in the UK the norm is that at least one minister must be Scottish and one Welsh. In Germany religion used to be an important representational factor for Chancellors to consider, but now less so. In other cases selectors can exercise significant discretion when applying the merit principle. One selector might decide merit is due to a region which secured the party victory in the election. Another might decide there is merit in bringing in a minister from an opposing faction of her party. Yet another might appoint a minister to signal recognition of meritorious contribution of the minister’s demographic group to the party’s electoral success. The important point is that in the process of forming cabinets, selectors have always had to hold a broad view of what constitutes ‘merit’. Therefore ministers appointed to cabinet embody different interpretations of the merit principle. Moreover, meanings of meritorious appointment have changed across time. In the past, loyalty to the PM was the dominant criteria that selectors recognised as merit. 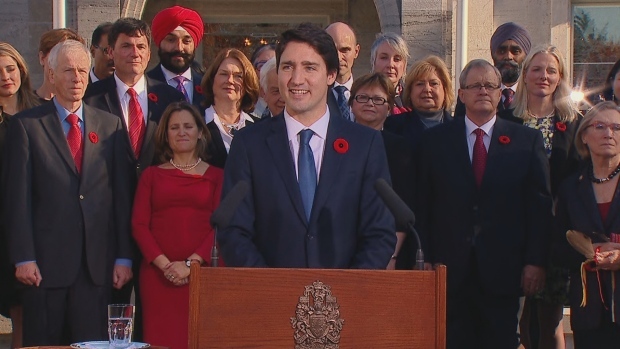 Trudeau said he wanted a cabinet that ‘looks like Canada’. Here he is invoking an alternative, but significant interpretation of merit. Why? As he said himself; ‘it’s 2015’. Previous postDevolving abortion law: a positive step or cause for concern?